One of the best features which has been introduced with the launch of iPhone 6 and iPhone 6 plus was 3D touch, the technology which has got a potential of changing the Touch Screen capabilities of Device. According to Wikipedia 3D touch is “A more sensitive version of Force Touch named "3D Touch" is included in iPhone 6S. 3D Touch works using capacitive sensors integrated directly into the display. When a press is detected, these capacitive sensors measure microscopic changes in the distance between the backlight and the cover glass. This information is then combined with accelerometer signals and touch sensors to provide an accurate interpretation of the user's intentions. The linear actuator within the Taptic Engine is capable of reaching peak output in just one cycle, and produce vibrations that last 10 milliseconds. When you press or hold the iPhone screen, it will trigger pressure-sensitive capability that will open up menus and actions on iPhone 6s or 6s plus, like you see on Apple Watch. You just have to press down or hold the screen and you can pull up or open up context-sensitive menus, switch or close apps or can also see photo effects like Live Photos. So, like on an Apple Watch, you just have to press or force your Apple iPhone 6s screen to do certain things the 3D Touch technology allows the device to recognize the pressure of a user's touch inputs, thus distinguishing between normal and more forceful touches. With the new version of iOS in this spring (beta versioned available), this technology will get more boost and users will have the option of using 3D touch on lock screen and much more. 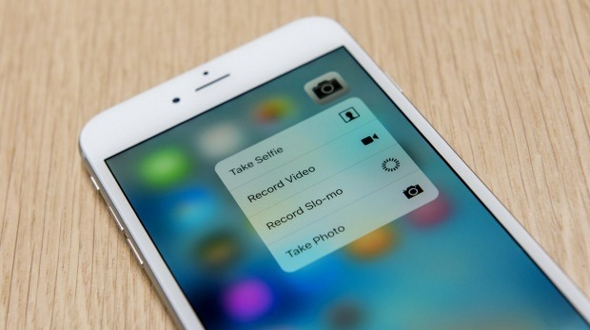 So today in this article we are going to talk about the 5 tips about the 3D touch on the iPhone, so be ready. Go to your Home screen and do a harder press on the icon for the Phone app (not just a normal tap/press - firmly push into the screen). You'll see that a useful little mini-menu pops up, offering the ability to call one of your more frequently called contacts, or to create a new contact. Do a 3D Touch press on the FaceTime or Messages app icons and you'll see similar quick-jumps to recently or frequently contacted friends - a very helpful means by which you can go straight to a call with a loved one without going into the app, searching through contacts and so on. The three main Apple communication apps (we're leaving aside Mail for the time being, but we'll come back to it in a moment) offer the most basic execution of the 3D Touch shortcut feature, but many other Apple apps have their own equivalents. The camera app's version of this may be the most useful. It has a mini menu that lets you jump straight to a normal photo, a video or a selfie, or even a slow-mo video. You'll never miss that important shot again. The App Store icon lets you go straight to an app search, and the iBooks app does something similar. (The iTunes Store currently doesn't offer this, oddly, but hopefully this is just a matter of time.) Mail, rather than offering shortcuts to specific contacts, lets you jump to individual inboxes (or start a new message). Safari lets you open a new tab, or a new Private tab, or jump to your Reading List. There are more to find - try a force-press on any app icon to see if it has a 3D Touch-activated mini menu - but my favorite is probably Apple Maps, whose shortcut menu includes an option to get directions home. Google Maps presently doesn't have a 3D Touch menu, which might conceivably give Apple Maps a slight advantage for a while. Peek and Pop might not seem like a huge benefit when you're working within one app, but when we start working between multiple apps you'll see the added convenience. Take directions, for instance. If somebody sends you an address in an email, for instance, you can tap it to jump to Maps and see directions. But if you do a harder press on that address, a handy map preview will appear without whisking you out of the Mail app. You can then swipe up, press harder still to go to Maps, or release to go back. 3D Touch will be activated by default on your new iPhone 6s or 6s Plus, but you can fiddle with a few settings or even turn it off (which will be just one of the craziest thing you will do on your iPhone) by going to Settings > General > Accessibility, swiping down to the unlabeled fourth group of options and tapping 3D Touch. This adjusts your sensitivity and once you're ready, turn to the next slide and we'll start exploring this new suite of features. These are some of the Tips for 3D touch, we do understand that there are many more such tips, if you know some share with us in comment section below and we will update the Article with your name.